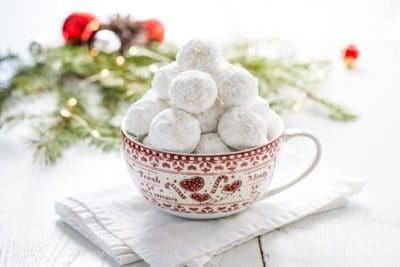 Russian Tea Cakes ~ also known as Mexican Wedding Cookies, Snowballs, or just plain Tea Cakes, are easy to make, crunchy sugar-dusted nut balls that are not too sweet, and melt-in-your mouth delicious! 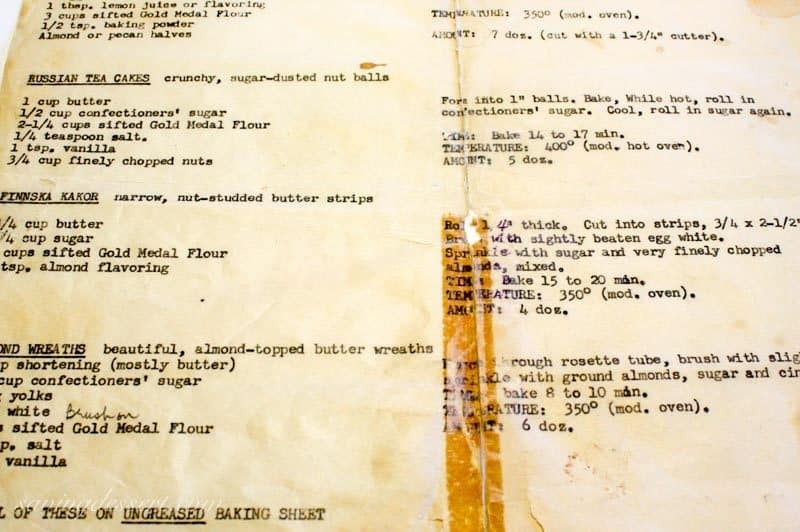 This recipe, and these cookies, bring a flood of happy memories to mind. Even the smell of them baking triggers vivid thoughts of my mom and the years when our own children were small. I’ve been making these cookies since I was a young girl, and given that I’m a grandmother now, that’s been a while. I still have my mom’s original typed recipe that I keep in a plastic sleeve. As you can tell, this recipe is very old and barely held together with tape. I work from a photocopy now so it won’t deteriorate any more. This recipe for Russian Tea Cakes has been well loved for a very long time. The description reads “crunchy, sugar-dusted nut balls” and that pretty much says it all. These are hands-down, without a doubt, my husband’s favorite cookie that I bake for the holidays. The ingredients are simple, and I believe that’s why these are so good. I’m often baffled how recipes using the same list of ingredients can turn out so different, but they do! The science of baking is fascinating. 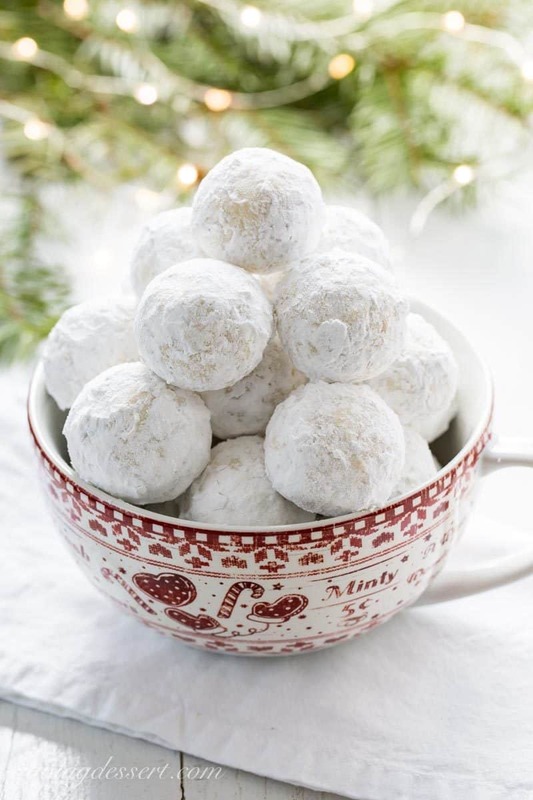 For these Russian Tea Cakes, all you need is flour, powdered sugar, vanilla, pecans, and butter. I’ve perfected these cookies over the years and added all my little tweaks and tricks to the notes section of the recipe card. We’ve always used pecans as our nut of choice, and instead of chopping, I grate the nuts for a very fine, powdery consistency. If you ask me, grating the nuts is the secret to making these a terrific melt-in-your mouth cookie. The cookies don’t dramatically change their shape when baked, nor do they need to get overly brown on top. If they are browned on top, they’re probably over-baked. Check the bottom of a cookie for a light brown color and try to make them ‘bite sized’ to prevent a sugar mess on the front of your shirt. 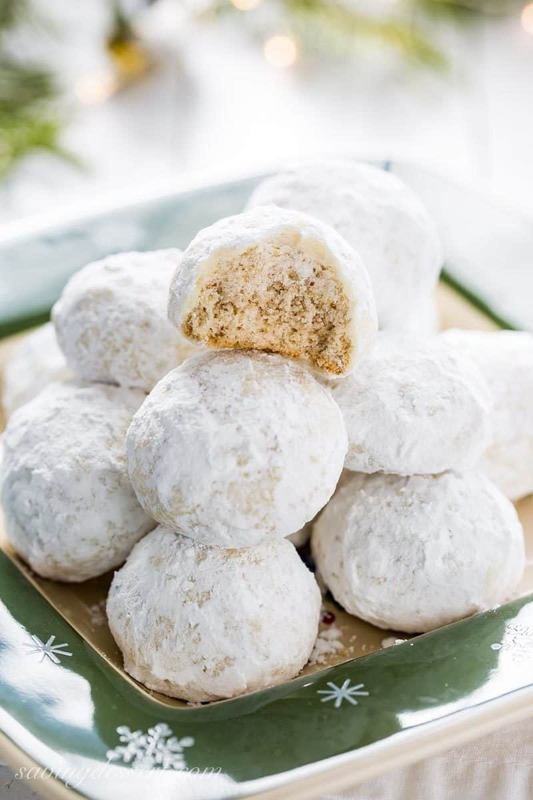 Also known as Mexican Wedding Cookies, Snowballs, or just Tea Cakes, these easy to make, crunchy sugar-dusted nut balls are not too sweet and melt-in-your mouth delicious! Preheat oven to 400 degrees. Line two baking sheets with parchment paper and set aside. Sift together 1/2 cup of the powdered sugar, the flour and salt. Add to a large mixing bowl along with the butter, vanilla and grated pecans. Mix on low with an electric mixer until the dough is starting to come together. Increase the speed to medium and blend until all ingredients are incorporated. Place the remaining 2 cups of powdered sugar in a low-rimmed pie plate and set aside. Scoop the dough (I use a small cookie scoop) and roll firmly into a 1-inch dough ball. Place the cookies on the parchment lined baking sheet and bake for 10-12 minutes or until lightly browned on the bottom. 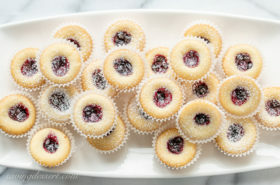 Once baked, immediately remove several cookies from the baking sheet using a small spatula and turn them upside down in the bowl of powdered sugar. Allow the hot cookies to rest in the sugar for about 30 seconds then carefully turn to cover the bottoms. If you mound the powdered sugar toward the center of the plate, this will help when you go to cover each hot cookie. Working with one cookie at a time, gently turn in the sugar until the entire cookie is covered. Remove to a wire rack to cool. Working quickly, repeat with the remaining hot cookies until all are coated. Once cooled (after about 1 hour) roll the cookies in powdered sugar again and store in an airtight container in a cool location. These cookies will keep about a week making them great to make ahead! Grated pecans will have a powdery, light texture. Scoop the grated nuts into a measuring cup, then lightly tap the cup on a countertop to lightly pack the nuts. Then add more grated pecans to the cup until you reach the desired 3/4 cup total. If you don’t grate the pecans, I cannot guarantee these cookies will turn out correctly. The flour is measured before sifting. When measuring flour, gently scoop the flour into the measuring cup and level off the top using the dull blade of a table knife. If you believe your oven runs hotter than it should, you may want to bake at 375 degrees. Test a small batch of cookies first, or reduce the time baked to ensure they don’t burn. Remove from the oven when the tops are set and the bottom is lightly browned. Don’t place the dough balls on a hot baking sheet. It’s best to alternate between cooled baking sheets or pieces of parchment. I use a rimless baking sheet that I love (see below for a link) so I can slide parchment onto the sheet and bake immediately. Even though you can fit a large amount of unbaked cookies on each baking sheet, I prefer to bake just a few each time since you have to roll them in the powdered sugar while hot. 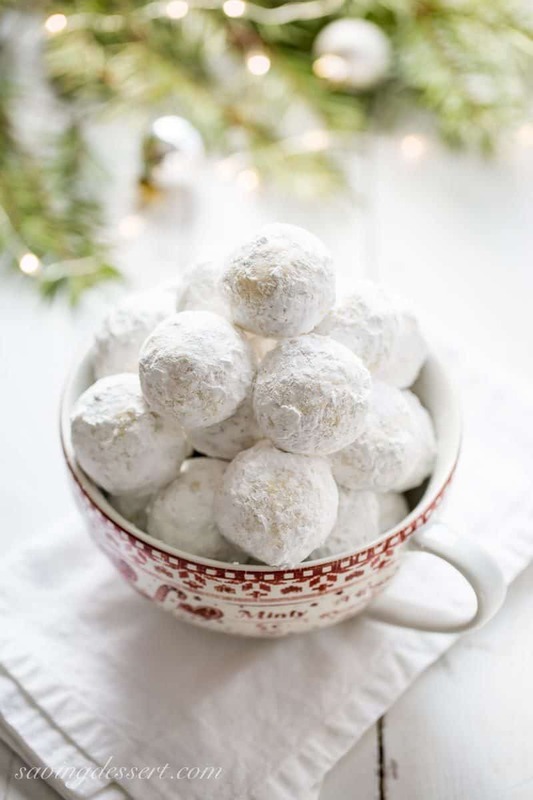 The hot cookie melts the powdered sugar and forms an icing covering the entire cookie - yum! If you decide to purchase something at Amazon after following my affiliate link, I receive a small commission, at no additional cost to you, which I use to pay for web hosting and services for this blog. Classic cookies are often the best desserts on the table. 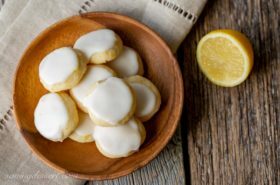 We love these Lemon Meltaways for another simple, lightly sweet one-bite cookie. These fun Vanilla Pretzel Cookies will rival those store-bought in the tin cookies any day! How about these super simple cookies all made with 1 Dough, 4 Christmas Cookies from Bless this Mess. Another great classic cookie with a short ingredient list, are these beautiful Holiday Pinwheel Cookies from That Skinny Chick can Bake. And finally, I really love these 4-ingredient Almond Joy Cookies from Mom on Timeout for a quick and easy treat. Thanks so much for stopping by! I hope you have a wonderful holiday season with family and friends. Blessings to all! I my recipe is exactly the same. Except my recipe also calls for 1 tsp Almond extract. I have made them without Almond extract. Definitely taste better with the Almond exract. Thanks for the feedback Karen. My husband prefers them the way I make them but since I’m a big fan of almond extract, I know I would like it. Thanks again. Hi Tricia, what a beautiful surprise when I google for a recipe and your website shows up. I am making today for the first time these cookies. i am using gluten free flour! I hope it turns out well. I am gluten free and I used to have these cookies every Christmas. Isn’t it amazing that our mothers & grandmothers would type out their recipes!! Mine are on index cards… also browned with age. 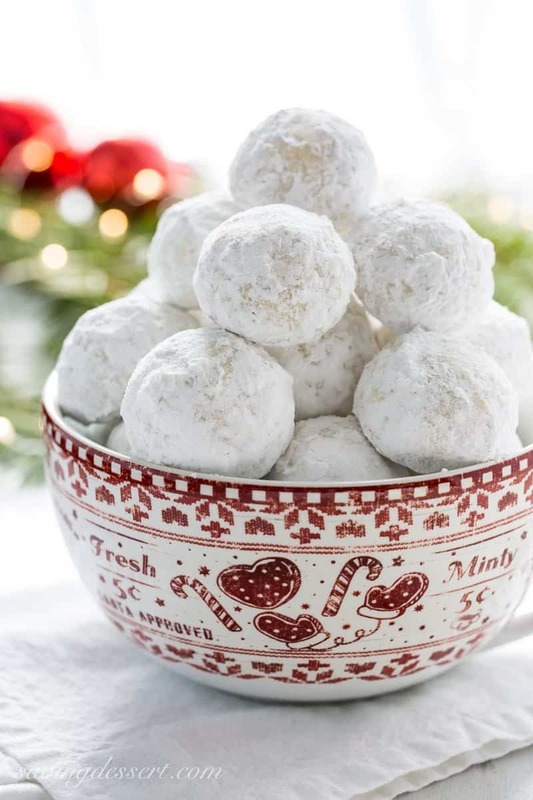 I started baking at age 8… and although I rarely take time to bake these days, Russian Tea Cake cookies are also a favorite at our house and a staple for Christmas & give-away Christmas Cookie plates. Everyone looks forward to these! Tricia, your description and realness of your blog prompted me to want to share. Depending on the consistancy of the dough, I add up to 1 Tablespoon as long as the dough isn’t too wet. These I roll into little balls. I use Grand Marnier and form these into little crescents (as Susan’s mother did… an idea I got from Gourmet magazine back in the late ’80’s 😁). Rolling cookies twice in the powdered sugar is key. I don’t grate my pecans… I have a coffee grinder that I only use for baking, so as not to impart the strong flavor of the coffee bean. Some say to make the cookies more melt in your mouth is to substitute shortening for a portion of the butter. I wouldn’t know. I prefer using real wholesome ingredients. Tonight, when I bake… I’m going to be trying a new gluten free baking flour that has everything already in it to make it an even 1 to 1 exchange. It’s a little more expensive, but worth a try, as now a lot of my friends are eating organic and have gone gluten & dairy free (except for fresh butter made from non gmo cows – lol). So, Enjoy!! … if you try my little twist! The cookies come out delicious. With every best wish for a Happy Christmas and a great 2019!! You are amazing Dana! We love Grand Marnier and cannot wait to give this a try. The coffee grinder is brilliant too! Thank you so much for sharing your ideas and comment. I wish you and very Merry Christmas and a super Happy New Year! Thanks for following along. 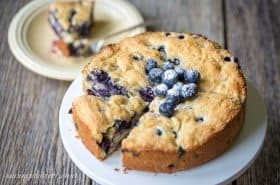 Can I premake and freeze this dough? Hi Lisa – I think that will be fine. I would roll them and flash freeze on a baking sheet before storing in an airtight container. That way they would thaw easier than if they were in one large dough ball. Enjoy! These have been a staple in our house for my whole life. Happy holidays to you and yours. Is there any way I could get the rest of the measurements for the Finnska Kakor? This is a cookie my grandma and mother made and unfortunately I lost the recipe when we lost our home in the wildfires in Colorado a few years back. I have a same name/similar recipe in one of the little supermarket books I replaced but to me it’s never quite been right. I’d love to compare it to what you have above. Thanks for sharing such a beautiful story and recipe. I have some old recipes from my grandmother that are oh so dear to my heart. Wishing you and your family a very Merry Christmas. 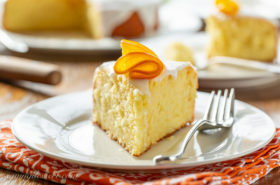 Thanks for all your wonderful recipe that make your blog so much fun to read and cook. Thank you Connoe! I appreciate you so much, and hope you enjoy some of our recipes. Merry Christmas to you and your family! I live in Costa Rica and first made these here about 15 years ago. I have not met a Costa Rican who doesn’t love these cookies. Even the kids prefer these to presents. I make them every year. Personally, they are far from my favorite cookie, but I’m required to make them. I even had to make them for someone who was pregnant and desperately craving them. Thanks for the comment Brenda! Everybody has a favorite cookie, and these are my husbands. You are a sweet friend to make these for those in “need” of a cookie fix! These cookies are truly a favorite world-wide. I hope you and your family have a beautiful, fun and joyous Christmas! Thanks for reading and commenting. Best wishes for a wonderful New Year! ♥ Love the mug too! These are so festive and cheery, they put me right in the Christmas spirit ~ have a lovely holiday Tricia, and I can’t wait to see what you cook up in 2018!! Love these! Your husband is a wise man — these are an excellent cookie. Yours look terrific — thanks. And Happy Holidays! How nice to bake from your mom’s original recipe. I love traditional foods for the holidays. Happy Holidays, dear Tricia. I’m thoroughly convinced that most of my favourite recipes are the old ones. There’s a reason they stick around that long 🙂 Beautiful! Have a wonderful holiday with your family, Tricia! I agree Jennifer – we love the classics 🙂 Merry Christmas to you and yours! 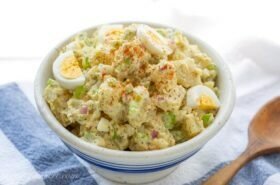 I love recipes with wonderful histories like this one Tricia. Your mind must fill with a thousand sweet memories as you mix up and bake these wonderful looking cookies! Yes it does Chris – I love food memories 🙂 Have a wonderful, blessed Christmas! Thanks Monica! Merry Christmas to you and your lovely family. Do you measure the nuts before or after crushing them? I am making these today! Sorry – your comment ended up in the SPAM folder! I measure after grating them – hope you loved them as much as we do! I am sorry that I don't Cathy. I would check Mary's site at Barefeet in the Kitchen. She has numerous gluten free recipes and perhaps you can find a good suggestion for a AP flour substitute. Even though we don't eat as much gluten filled products as we used to, I never tried making these any other way. Let me know if you do and how it turns out! Thanks for stopping by. Hello, i am from Russia and i think it will be interesting for me to try your recept. Did you try to do it with other nuts?